An Indian court has convicted two members of an outlawed Islamist militant group over twin blasts in the southern city of Hyderabad in 2007. At least 42 people were killed and more than 60 wounded in explosions at an open-air auditorium and a restaurant. The two members of Indian Mujahideen will be sentenced on 10 September. There have been at least nine attacks in Hyderabad since 1992, with the most recent one in 2013 when two explosions killed 12 people. Five men, who were accused of playing a role in the 2007 blasts, were arrested by an anti-terrorism squad in 2008. Only two of them were convicted on Tuesday while two others were acquitted. The court will reportedly announce its verdict on the fifth accused on Monday. About 170 witnesses were examined and questioned during the trial in Hyderabad, one of southern India's main commercial hubs. "In the course of the investigation, it was found that the convicted were operatives of the Indian Mujahideen militant group," K Surender, a lawyer representing the investigating agency, told BBC Telugu. The Indian Mujahideen has been blamed for a string of deadly bombings. The explosions took place minutes apart at an open-air auditorium and a popular outdoor restaurant. Hundreds of people were watching a laser show at the Lumbini Park when the first bomb went off there. 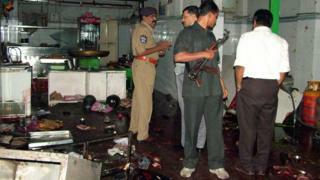 The second attack took place at Gokul Chat shop - a restaurant serving snacks and savouries. "I am not happy with verdict," said Chandra Nayak, who lost her left eye in the Gokul Chat blast. "If two people were acquitted, why were they put in prison for so long? Even after such a long wait, we didn't get justice."